The Holy Spirit Perfects and Renews Us. The Holy Spirit renews us in baptism through his godhead, which he shares with the Father and the Son. Finding us in a state of deformity, the Spirit restores our original beauty and fills us with his grace, leaving no room for anything unworthy of our love. The Spirit frees us from sin and death, and changes us from the earthly humans we were, men of dust and ashes, into spiritual humans, sharers in the divine glory, sons and heirs of God the Father who bear a likeness to the Son and are his co-heirs and brothers and sisters, destined to reign with him and to share his glory. In place of earth the Spirit reopens heaven to us and gladly admits us into paradise, giving us even now greater honor than the angels, and by the holy waters of baptism extinguishing the unquenchable fires of hell. We humans are conceived twice: to the human body we owe our first conception, to the divine Spirit, our second. John says: To all who received him, who believed in his name, he gave power to become children of God. These were born not by human generation, not by the desire of the flesh, not by the will of man, but of God. All who believed in Christ, he says, received power to become children of God, that is, of the Holy Spirit, and to gain kinship with God. To show that their parent was God the Holy Spirit, he adds these words of Christ: I give you this solemn warning, that without being born of water and the Spirit, no one can enter the kingdom of God. Visibly, through the ministry of priests, the font gives symbolic birth to our visible bodies. Invisibly, through the ministry of angels, the Spirit of God, whom even the mind’s eye cannot see, baptizes into himself both our souls and bodies, giving them a new birth. Speaking quite literally, and also in harmony with the words of water and the Spirit, John the Baptist says of Christ: He will baptize you with the Holy Spirit and with fire. Since we are only vessels of clay, we must first be cleansed in water and then hardened by spiritual fire – for God is a consuming fire. 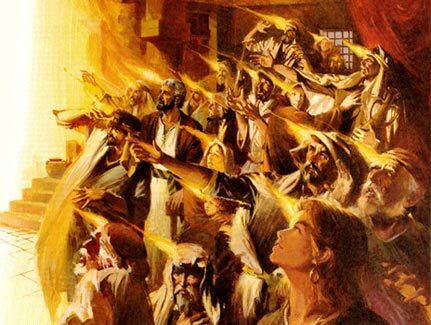 We need the Holy Spirit to perfect and renew us, for spiritual fire can cleanse us, and spiritual water can recast us as in a furnace and make us into new men and women.